Egypt's parliament, packed with loyalists of President Abdel Fattah al-Sisi, is to vote Tuesday on changes to the constitution that could keep the former military chief in power until 2030. Sisi led the army's overthrow of elected president Mohamed Morsi in 2013 following mass protests against the Islamist leader's rule. He won his first term as president in 2014 and was re-elected in March 2018 with more than 97 percent of the vote, after standing virtually unopposed. His government has been widely criticised by human rights groups for the repression of political opponents. "The constitution in 2014 was written under tough exceptional circumstances," he told AFP. He hailed Sisi as a president who "took important political, economic and security measures... (and) must continue with his reforms," in the face of the unrest gripping neighbouring countries following the toppling of veteran president Omar al-Bashir in Sudan and the escalation of the conflict in Libya. Keeping Sisi in power, he added, reflects "the will of the people". The authorities have jailed thousands of Morsi's supporters as well as liberal and secular activists, including a popular blogger, actors, singers and journalists. Last week, Human Rights Watch warned that the amendments, which would also increase the military's political role and grant Sisi control over the judiciary, would "institutionalise authoritarianism". As Sisi visited Washington for talks with President Donald Trump, it urged Congress, to withhold endorsement of the Egyptian president's bid to extend his rule. 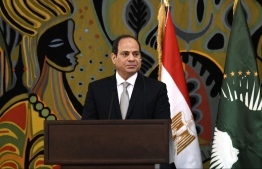 "Congress needs to use its levers to pressure the Egyptian president to reverse course, starting with withdrawing these constitutional amendments set to consolidate authoritarian rule," said HRW's Michael Page. Other proposed amendments include a quota for women's representation of no less than 25 percent in parliament and forming a second parliamentary chamber.